I’m excited to try out something new and do more hands-on. Tell us a little bit about yourself and your role here at PushON, Catherine. I graduated from Lancaster University in 2016 with a degree in English Language. During my time there, I completed several marketing placements and landed my first job as a Marketing Executive at an agency in Shrewsbury shortly after graduating. I’m now working as an Account Executive at PushON, which means I handle client relationships and accounts. I’m excited to try out something new and do more hands-on work compared to my previous role. I believe you’ve had a move from Shropshire to Manchester; how was that? That’s right! I recently relocated from Shropshire to Manchester with my best mate, so I’m still settling in. We moved for the career opportunities – and so far it’s paying off! I’m quite familiar with Manchester anyway and already know the area well, so it’s really exciting to be living here. Is Manchester what you expected it to be? Definitely – I visited a lot when my sister went to Manchester University and during my time at Lancaster University. It’s a really vibrant city with lots going on, so it’s pretty different to Shropshire. One thing I’m finding hard to get used to is how busy the roads are, though! My first and previous job was at a small marketing agency. 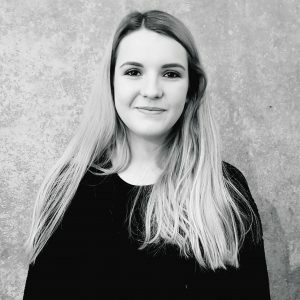 I started as a graduate trainee and left as a marketing executive, where I dealt with most areas of marketing – from content marketing to email. I used to complete work handed out by the account managers, so it’s refreshing to be on the accounts side! What are you looking forward to the most, working at PushON? I’m looking forward to settling in and getting to know the clients I’ll be working with. There’s a strong focus on teamwork and socialising at PushON, so there seems to be plenty of opportunities to meet people. As well as providing your wonderful services to us, what would you like to gain from working here at PushON? First of all, thank you! I’d like to develop my skills in account management and be an asset to the team. I have experience in completing successful projects for clients, but it will be great to have more communication with clients. Are there any accounts which you are looking forward to working on? I’m working with a varied selection of clients, all of which are different to those I’ve worked with previously. It’s always fun to work with clients whose products and services relate to my interests, but it’s equally as interesting to learn about unfamiliar businesses. So to answer the question, I’m looking forward to working on all of the accounts! PushON is really growing in size and the number of women here are increasing, have you been involved in any women in tech initiatives in your previous companies? The agency I previously worked at was mainly composed of women, which was lovely! However, I’ve never been involved in any women in tech initiatives – I’m looking forward to getting involved at PushON. Do you have any ideas on what we can do to attract more female applicants? I guess it totally depends on the person and their experience, but I was personally attracted by the agency’s reputation and the size of the team. I also liked the focus on the women in tech initiative after reading through the PushON blog – perhaps this could be emphasised on the website and job listings. Any last words for someone looking to get into account management? One thing I’ve learnt quite quickly is that you’ll need to be proactive and go above and beyond your daily duties. Being a people person helps, too!